Beading Arts: Introducing Cherry Tree Beads...and some pretty exciting news! Introducing Cherry Tree Beads...and some pretty exciting news! Cherry Tree Beads got up and running originally because of Bill's wife BeBe's interest in beading and selling her pieces. As often happens, one thing led to another until Bill had a business that was employing family members and other staffers, and was averaging over 40 bead shows each year! Not too bad! Bill explained that he began traveling overseas to find better and better sources, especially for the gemstone beads that he personally is so crazy about. In fact, when this post goes live, Bill will be in China on a buying trip...hiya Bill, travel safe! Besides gemstone beads, Cherry Tree Beads has glass beads, base metal, freshwater pearls, resin beads, all kinds of findings and supplies, and assorted goodies that Bill happens across and happens to like! Now here's the surprise: BeBe packed up a huge boxful of beads that she and Bill sent me to examine the quality and to give away to YOU!! Believe me, the quality is just fine...you will be very very pleased if you either order from them or win one of these giveaway packages. The thing is, BeBe sent so much that I've decided to do at least SIX giveaways during April and May, so don't forget to keep checking back for more chances to win this Spring! Would you like to win it? Just leave me a comment below and you'll automatically be entered to win. If you tweet or post on Facebook or other social spots about the contest, you can leave a second comment and be entered twice! Please make sure that your link will lead me to an email address, or else I won't be able to contact you. No contact, no win, and I simply have to go on to the next person. Deadline: April 21, 2011. Love those colOrs! Pick me! I love a great give-away! Count me in please! And here's my entry for my friend Chris Murphy who is not able to leave a comment herself! I buy from Cherry Tree Beads when they are here in Charlotte for bead shows. I have been VERY VERY pleased with my purchases and the staff for the bead show are great. Since you can never have too many beads, I would love to win more. Cetrine is my favorite gemstone! The beads are beautiful. I will definately be adding Cherry Tree beads to my list of fav sources! Those Are beautiful. I would love to win. Just tweeted too. Wow, love the three different sizes! Great-looking beads! My head is full of project ideas now! 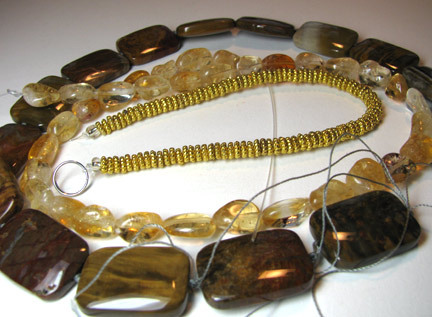 I love petrified wood, especially, but all these beads are beautiful and I would love to win them! Nice selection. I'll have to check out their site. Wow, I clicked on a close up of those pieces & they look wonderful. My colors too, Cyndi! What a great lot! Please count me in! Of course I'd love to win these! Very pretty. It's so nice of people to give you these things for give-aways. They are gorgeous! I will definitely check them out! I have blogged about it as well! I'm heading over to their site now. Love, Love, Love these beads!!! Oh, I love petrified wood. Would love a chance to win this. Oh, my gosh! Count me in. :D I loooove semi-precious stone beads!! Those colors are so warm! I would love to give them a new home. Oh how wonderful, thank you so much for the chance to win, love beading when I get the chance. Great collection! I would be so thrilled to win these pretties! They're my colors. Yay! Oo smart pebbles, very much like to participate.